<- We end last week with a WWE/World title unification match tease and start this week with CM Punk. While we all really want to know what’s going on in the main event picture, I think it’s fantastic that other players can be thrown into this storyline as well. <- Stephanie McMahon’s theme music hits & I roll my eyes. They obviously are doing something right with Stephanie. <- I have to say, I’m starting to love the new Kane & his character switch was so drastic I wasn’t convinced it would actually work. Glen Jacobs has surprised us a lot over his career but this switch is definitely showing a different range for Kane. <- Well there it is in black and white, there will be a WWE & World Championship Unification match at TLC between John Cena and Randy Orton. I like that Michael Cole announced that ONE man would walk out as ONE champion. Can’t make it much clearer than that. <- And now there’s a number one contender’s match for the Intercontinental Championship. Could they also be rebuilding the little prestige the IC title has since there will only be one “main” champion? <- Damien Sandow versus Big E Langston is interesting but nowhere near appealing as a match between Langston and Dolph Ziggler. Either way, the Intercontinental Championship is being featured again. <- So next week is the go home show for what could be the biggest pay-per-view in recent memory with a title unification match… and it’s the Slammy Awards. Good timing. <- OK, “Bad New Barrett” MAY not get over (at all) but he made a damn good point about Oklahoma City. <- So we don’t get any explanation about what actually happened to Bryan when the Wyatts “abducted” him last week & no one when looking for him. Now everything’s just back to normal except that Bryan is feuding with The Wyatt Family, probably without CM Punk as well. What the hell happened? <- This is the longest match I’ve ever seen Rowen in and I was surprisingly impressed. He might not have the agility or overall character that Luke Harper has but he’s a serviceable big man. <- Very cool promo from Bray Wyatt and I love the twist of Wyatt trying to recruit Daniel Bryan. Wyatt’s strongest talent is his promos so why not have him try to talk Bryan into the “Family”. 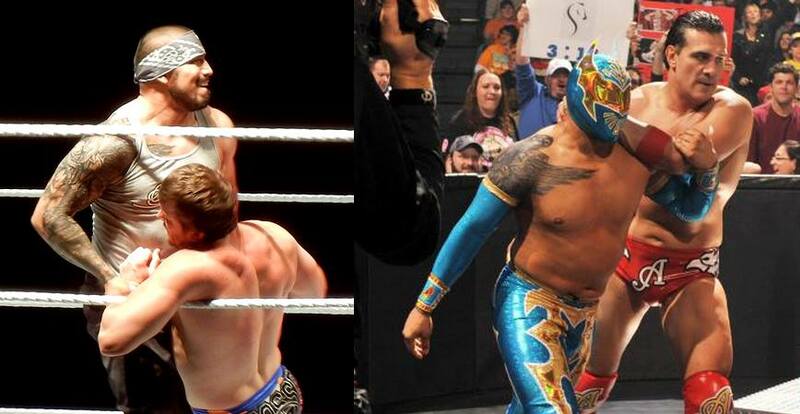 <- Holy crap that is a HUGE tattoo on Sin Cara. Did they replace him without anyone knowing? <- What the hell type of promo was that from Del Rio? The was Zeb Colter 101 and out of character for Del Rio. He just needs to be taken off of TV for a while and hope his character gets the refreshment it needs. <- Annnnnnnd Sin Cara just knocked himself silly by missing the top rope moonsault to the floor. I guess it is still the original Sin Cara. <- Hey, that was a pretty swanton bomb and Sin Cara gets a win on TV! <- Is anyone else wondering why Dean Ambrose hasn’t been put into a single’s feud yet for the United States Championship? <- It took a little over a year but I’m bored with these 6-man tag team matches. I don’t know if it’s The Shield or their opponents but I’ve hardly paid attention to this matchup at all & I don’t feel like I’m missing anything at all. <- Except of course for the inhuman resurgence of Goldust. Creative finish as well & it’s nice to see The Shield winning again, although I want to see them winning single’s matches. <- Ryback and Axel don’t even get an entrance? That’s a hard fall. <- And Miz’s heel turn is explained as a bad night and he & Kofi have “buried the hatchet”? Lame. 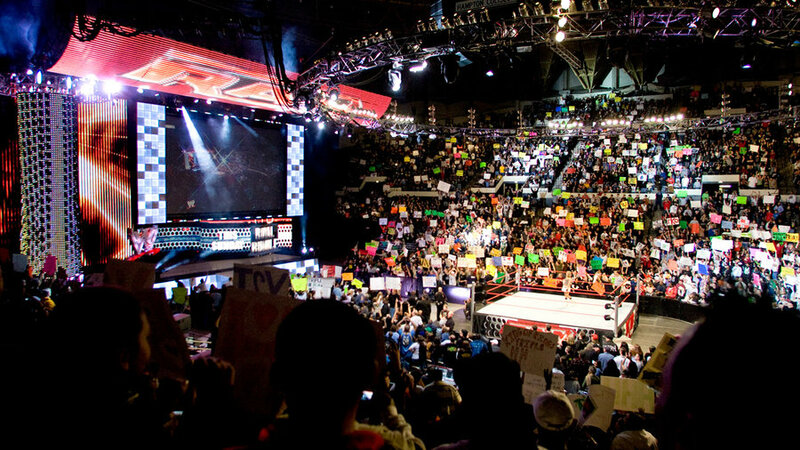 <- That’s two matches where the men who didn’t get entrances picked up wins (Damien Sandow & Ryback/Axel). <- I guess I should have known it wasn’t the real Sin Cara. There’s no way a guy who had a match called off on live TV because of a dislocated finger would be able to sit through a tattoo like that. <- Trying to decipher all of the different rhetoric that is being used for this match build up is absolutely exhausting. <- John Cena spoke a lot of truth when talking about his and Randy Orton’s history & is still pretty damn good when he decides to play his promos seriously. <- Unfortunately this segment was everything that these segments always turn out to be. And although they have one more week to build this match, it’s the Slammys next week and an undisputed championship match shouldn’t be second to anything on any show.